The Cort AD810 dreadnought acoustic guitar boasts a crisp and warm sound. Featuring a full-sized dreadnought body and spruce top, the AD810 offers a balanced tone that is ideal for stage, studio or home use. The Cort AD880CE acoustic guitar boasts a crisp and full sound. Featuring a dreadnought cutaway body and CE304T pickup, this guitar ensures optimal functionality while offering a warm and balanced tone that is ideal for stage, studio or home use. The Cort MR710F offers outstanding value with a solid Sitka spruce top and Fishman pickup system with a natural satin finish. Perfect beginners acoustic guitar pack. 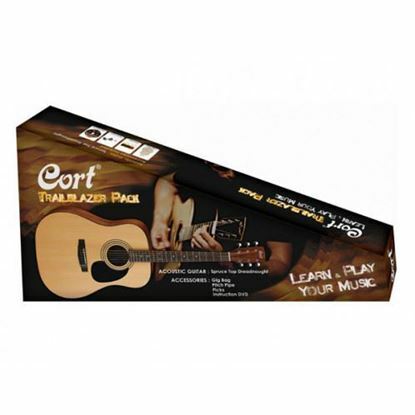 Includes full size acoustic guitar, DVD, gig back, pipe-tuner and guitar picks. Solid spruce for a strong resonant guitar, and a 3 band EQ to get the most out of your tone. The Cort AF510 concert sized acoustic guitar boasts a crisp and focused sound. Featuring a compact body and spruce top, this guitar ensures optimal functionality while offering a warm and balanced tone that is ideal for stage, studio or home use.